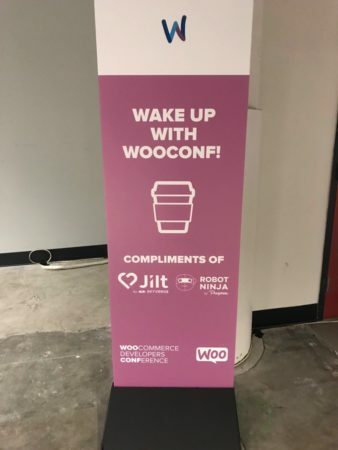 We’re a few weeks past WooConf, but better late than never I suppose 🙂 I wanted to share some of the things our team was up to recently at WooConf, along with the planning that went into this as our first major sponsorship for an event. Since giving back is a big focus for us, most sponsorships we’ve done thus far have been small in scale, mostly to support a local event or WordCamp. 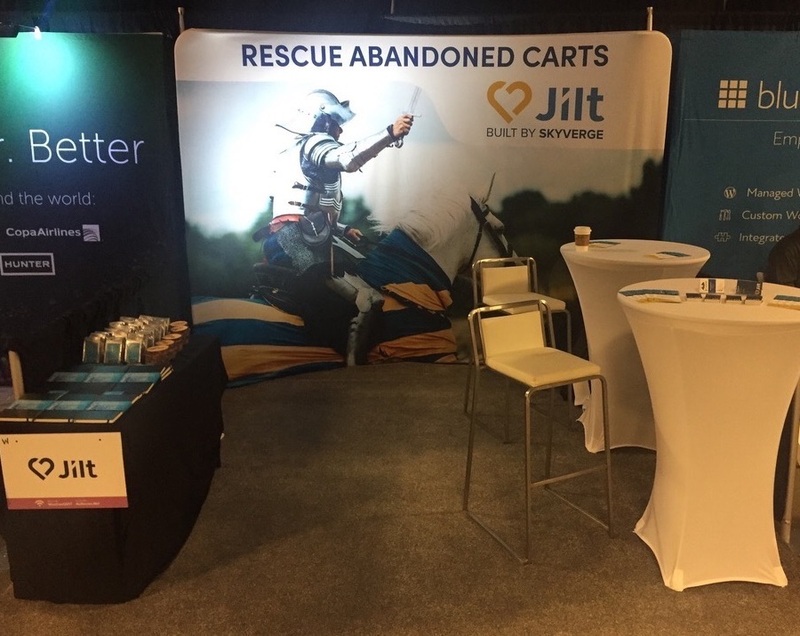 For WooConf, we wanted to raise brand awareness around Jilt as well as meet developers using our software, so we went in for a larger sponsorship, which meant setting up a sponsor booth and swag. We also had a much larger turn-out for our team this year, with half of our team (10 people) to bring into town for the event. Accommodations: definitely a tough one for us this time around. 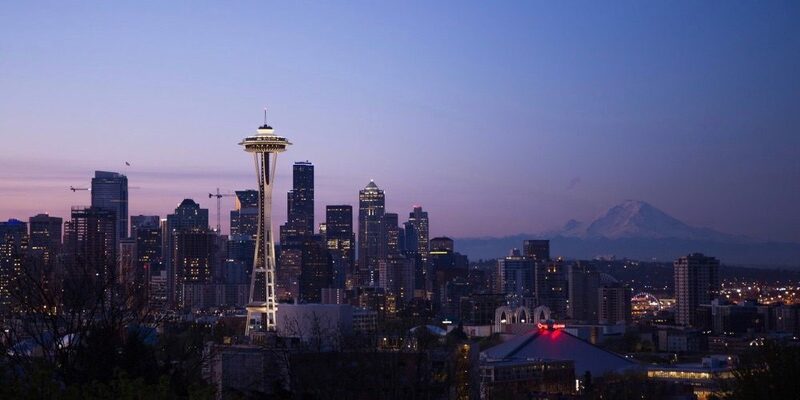 We prefer to rent a house with the entire team when we can, but alas, Seattle doesn’t seem to like big houses. Instead, we grabbed hotel rooms and assigned roommates beforehand. It’s helpful to do this so you can plan travel together if possible. When everyone is arriving, choose a location to meet at the airport before your travel day. Most airports have maps so you can pick a place right outside of security (in our case, we had checked bags with swag, so this was important! ), so we sent this to the team beforehand. Many of us arrived in groups, so each group could sync up and get to our hotel without wandering. This is especially important if you have international team members arriving, who may not yet have internet access. For communication, we created a dedicated Slack channel for #wooconf. Here we coordinated things like what time we were leaving in the morning, small groups for breakfast, and other on-the-go activities. This was vital to keeping everyone on the same page without dropping announcements into our general team channels. Since we had an exhibit space, Catherine also drafted up a schedule for us to ensure our booth had team members at all times. While we didn’t exactly stick to this, it helped keep someone available to chat throughout the day. Finally, since this was the first time we’d set up our exhibit display, Kim had noted we should probably take a backup frame since ours was being shipped to the event. It turned out that we arrived and the wrong one was sent, so we wouldn’t have had a backdrop without one we borrowed from another company. If this is the first time you’re setting up a space, absolutely do a dry run and have backup plans for crucial parts of your space like this. The only thing I wished we’d thought of: our super-partners for WooCommerce AvaTax, Avalara, had a hand-steamer for their backdrop so it looked pristine — this is something we’ll grab for next time. In addition to a general sponsorship, we wanted to be sure we also sponsored one of the most important parts of the conference: morning coffee. We co-sponsored a barista for the morning with Prospress to star the day off right. Definitely a good choice. Keeping with the coffee theme, we also included small bags of Counter Culture Coffee as our swag, which was a big hit. We <3 Counter Culture as WooCommerce merchants who use some of our plugins, and they make delicious, clean-tasting roasts. And of course, with mainly developers attending the conference, having as much coffee as possible was a necessity. Throughout the day, our team attended some excellent keynote talks, met up with agencies, partners, and other developers, and mostly tried to stay out of the rain. Followed by drinks and snacks at a local event space. 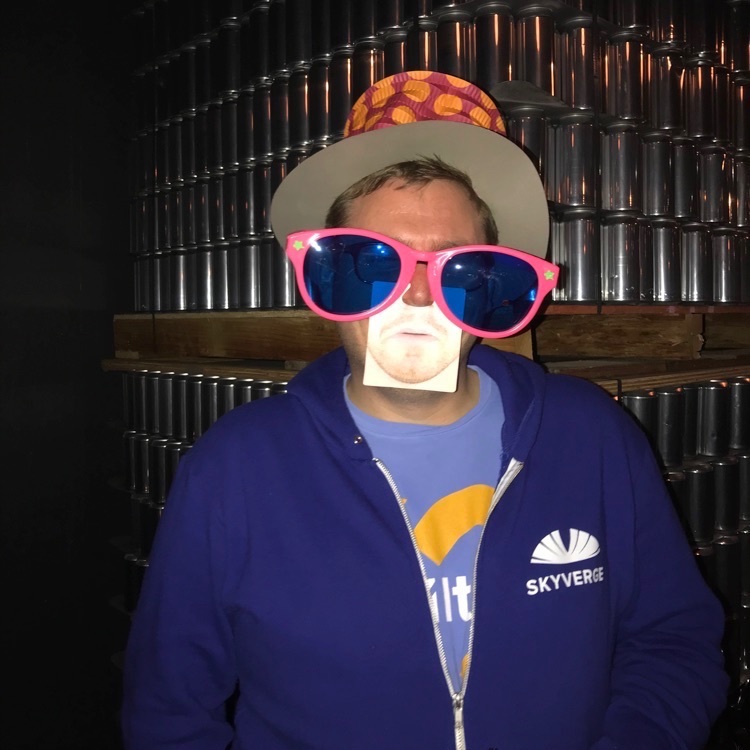 As an icebreaker, we decided to have ridiculous props available for fun photos, including hats, oversized glasses, and mouth coasters (which is now a thing I know of, and I’m not sure if it’s good or bad). 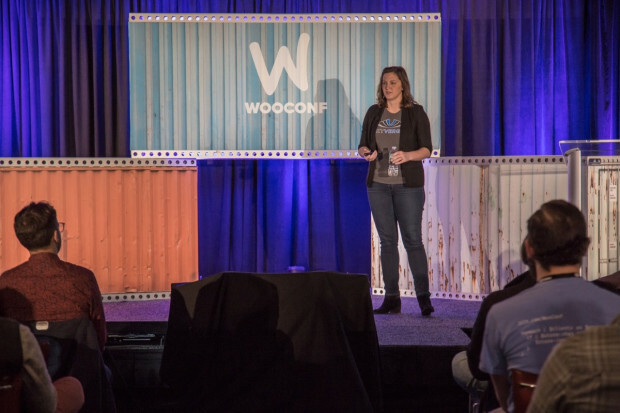 She covered why open source eCommerce is a powerful choice for merchants, and some of the pros and cons of using an open platform like WooCommerce vs hosted, proprietary systems. Photo Credit: Thank you to Heather at ImageThink.net for illustrating each talk! Much of the rest of my Day 2 was spent talking to developers about Jilt and our partner program, so I’m looking forward to checking out videos of the remaining talks. We ran a giveaway for a bunch of prizes, so while the link for this was on our swag, we could have also had some signs around the giveaway at our booth as well. We also could have made it easier to enter the giveaway by having a fishbowl for business cards. 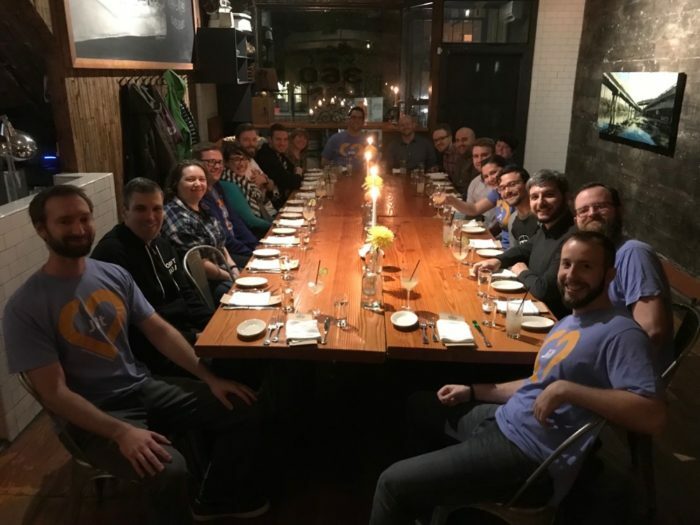 While it was important to us to talk to people and hear about how they’re using WooCommerce or how their clients do, I could have also followed up with more people via email even if we didn’t get a chance to chat at the conference. While we were conscious of our booth layout, we didn’t think about lighting. We ended up in a pretty poor spot without adequate lighting, so having our own lights around our display will be something we think about in the future. Meeting our own new team members! This was the first time I’d met Julie, Ian, Tabitha, and Alex. Did I mention we’re hiring? New positions coming soon as well! Connecting with Avalara for dinner before the conference and at the event. We’re lucky to work with their team, they’re excellent partners and they build a great product. It’s always great to see the Prospress team and catch up where we can. Our companies work closely together, so our teams are always excited to see one another. Meeting some WooCommerce team members I hadn’t met in person previously, and seeing those that I have again. 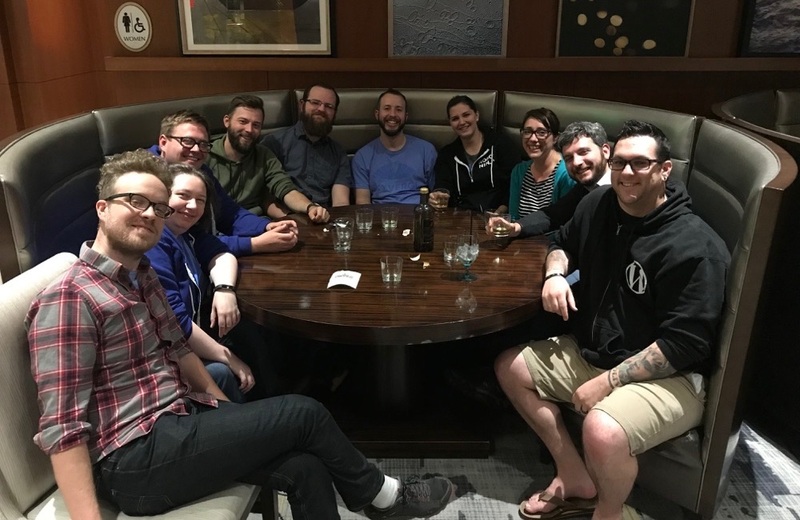 I first met some of the WooCommerce team at WCEU in 2013, and meeting more team members is something I look forward to at every WordPress-related event. Seeing other WordPress friends, in no certain order (unless, of course, they want to read into this anyway): Justin Sainton, Brian Richards, Mitchell and Dom, Patrick and Zach, and many others. Meeting new agencies, developers, and store owners! I love hearing about how WooCommerce and our software is being used in the wild, and thank you to every person who stopped by our booth to chat. If we didn’t sync up after the event, drop me a comment here and I’ll reply via email. I’m glad we’d learned a fair bit about team travel for our last SkyTrip. One thing I’ve taken away from this is to be sure teammates rooming together arrive together if at all possible, as this made check-in harder for some. If you’ve never gotten a booth, be sure to stage it before the event, and for crucial pieces (like your backdrop), build in redundancy if you can. Having our frame in RAID 1 was a life-saver. If you’re going to host an event, have signs there, too. I think our party would have been great if we had posted a hashtag so we could find all of the fun photos on Twitter and Instagram during the party and later. I saw some we were tagged in, but crazy photos were the best part of the party, and I’m sure I missed some. Be sure you know where stores are close by that may have things you need, and budget for them. We knew there was a Target nearby, and I’m glad we did, as this helped put the final touches on our booth.